“Generation 3: Ponyville” series that no doubt inspired this musical. Featuring several popular characters and numerous songs including catchy originals like “Disco Dash,” “Try a New Color on For Size” and “Shake Your Cutie,” My Little Pony Live! 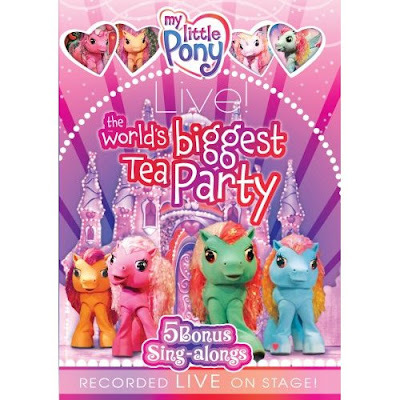 The World’s Biggest Tea Party also incorporates some of the better known tunes from various My Little Pony DVDs over the years. Likewise, it’s of even greater interest for collectors of the series with its inclusion of characters such as Thistle Whistle, Rarity, Wysteria, The Breezies, Minty and others that “no longer exist” in the line today. With the newest Hasbro line dubbed “Core 7,” as Wikipedia explains, which for marketing reasons has been chopped down to “only seven characters” and zero plans for “no new characters [to] be issued,” instead blending together older versions of numerous characters in one, this DVD comes at an ideal time to serve as a celebration of the series as a whole and the way they touched the lives of the various generations around the world since their launch. The DVD, which includes five animated sing-along songs complete with the words at the bottom of the screen, is also accessible for the hearing impaired throughout the feature for televisions equipped with closed captioning. Directed by the Emmy award-winning television veteran David Stern, whose resume of experience in filming elaborate stage productions is nearly a mile long, this bright, upbeat, and beautifully digitized transfer invites participation from not only the audience being filmed (with many cuts to happy dancing and smiling children and parents) but also from the kids at home. However, as any Pony fan will tell you, Spike’s just the warm-up act and the real show begins when Sweetberry, Rainbow Dash, Pinkie Pie, and all their friends take the stage. When the ponies decide to hold a huge tea party for their audience full of new friends at Rarity the unicorn’s glittery, sparkling Crystal Rainbow Castle, the group swings into preparation. From learning the proper tea drinking etiquette to striving to create the world’s biggest invitation, and visiting the ever stylish fashionista pony Sew-and-So to make sure they’re all well dressed, it seems like nothing has been left to chance. Although, amidst all of the singing, dancing, and merriment performed on a highly colorful stage with a curtain made of streamers ready to “razzle and dazzle,” the perpetual worrier Pinkie Pie, who was overly concerned that her friends including the sweet but admittedly accident prone and forgetful pal Minty would neglect their duties, mistakenly forgot one of her very own — namely, bringing the tea. As they decide to “squink” a.k.a. “squeeze and think,” and Pinkie Pie fears that she’ll be shunned, she realizes that in the end everyone makes mistakes and the most important thing in addition to “bounce back ability” is that you always have a great supportive base of empathetic and loving friends to help you solve any problems that may come your way, whether it’s in Ponyville or in the real world. By, as they say, looking at “what can happen when you’re positively pink,” kids can get lost in a carefree, magical world for sixty-five minutes. Moreover, thanks to the performers and Stern’s direction, you won’t have to worry they’ll be overly sedentary instead invited to join Rarity’s love to “skip and flip” and “dance and prance,” while helping Pinkie and her friends along the way. Additionally, thanks to the cute sing-along songs included in the special features that light up as each word is sung, it may also help encourage greater phonetic skills than your run of the mill toddler DVD. And as an even greater bonus—it’s not to mention one that contains catchier songs than the rest as this reviewer is still humming “Shake Your Cutie” a full day later.